Today is the reveal for the Art of Awareness Blog Hop hosted by Lori Anderson of Pretty Things and Heather Millican of Swoondimples. 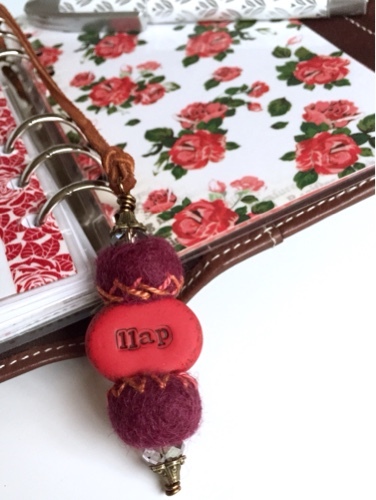 The idea behind this blog hop is to make handmade jewellery featuring the handcrafted polymer clay “word beans” from Swoondimples. Each designer has chosen their own words and colours to reflect their personal cause. I decided to create a piece to support Hearth Health which is an issue for myself and much of my extended family due to a wonderful (*sarcasm intended) disease called Familial Hypercholesterolemia. 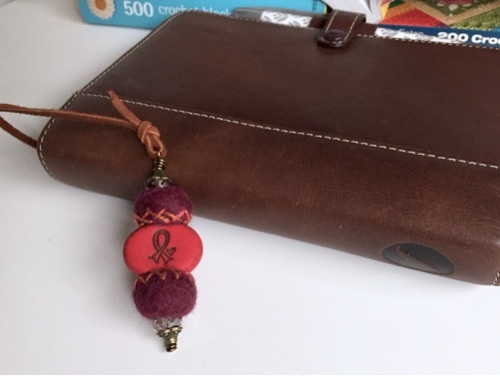 I created a bookmark for my medical Filofax. 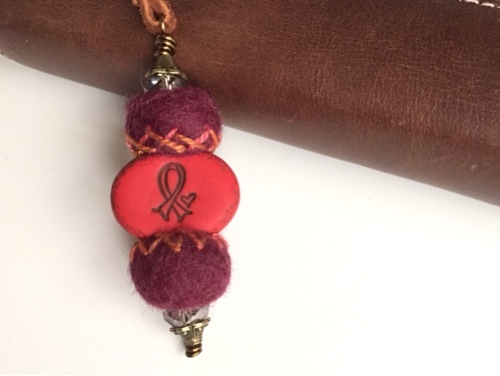 I used brown leather and plum coloured felt beads which I embroidered with variegated thread. In future I must remember to embroider the felt beads before assembly, it’s really tricky doing this around the other beads, lol. And this is how it sits in my Filofax. I just open the rings and thread the jumpring on and close. When I get bored with my vintage Hamilton Filofax I can easily transfer all the papers and dividers along with my new bookmark into another planner. What’s on the other side of my bead? I really didn’t know what word to choose to have on the other side of my bead! I wanted something about a long life and both creative and emotional fulfilment and when Leonard Nimoy (the original Mr Spock) pass away I knew exactly what to put on my bead. Live Long And Prosper. I think it matches rather nicely with the vintage red roses I use for my dividers. I’ve rather enjoyed creating this mixed media piece and hope to play with more felt beads and polymer clay soon. Well, that wraps up this weeks blog hop. Please visit the other participants in The Art of Awareness Blog Hop. Lovely Karen, what a great little bookmark! I had to read that disease 5 times before I even thought I came close to pronouncing it. I’m sticking with heart health. Love this bookmark. what a clever idea! The bookmark is wonderful and I especially love your choice of words. I love that you made a bookmark for your medical file. Plus, it is beautiful. I really like the embroidered felt beads!! What a great phrase for your bead. What a great design. The felt beads look great with the bean. 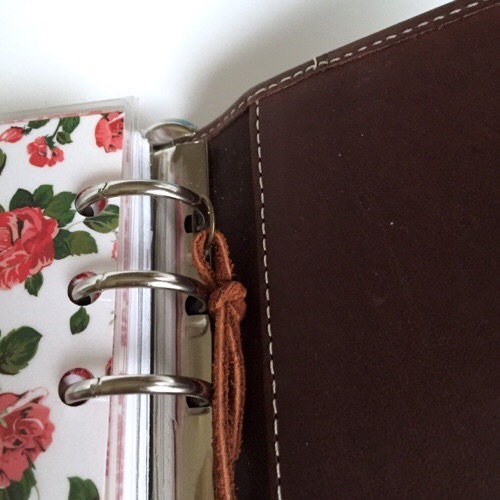 the bookmark looks great with the inside and outside of your Filofax. What a brilliant use of the bead! Thank you so much for sharing your story and your piece with us! I love what you created with your bead – something unique and will be used all the time. I think your quote is perfect too! Live Long And Prosper! Best wishes! So great to have made something like a bookmark that you can see and touch and take in on a daily basis! How lovely having something pretty near by that you get to enjoy and see often – love the felt beads with it! What a lovely bookmark ! And boy, I know all about annoying genetic ‘gifts’… Though in my case nothing as bad as heart disease, thankfully. :( I hope things keep being good for you and your family for years to come. Brilliant idea and so well excuted. 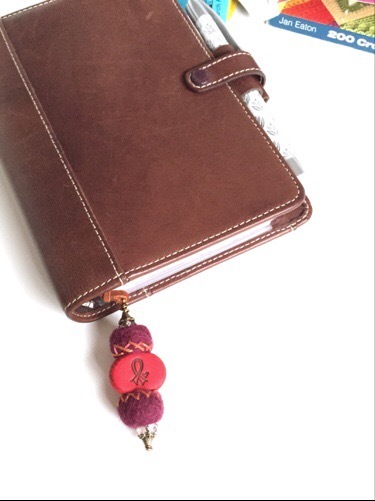 Your bookmark is adorable and goes so well in your journal. Good health to you! Love the colors and the felted beads…great combo and great piece! 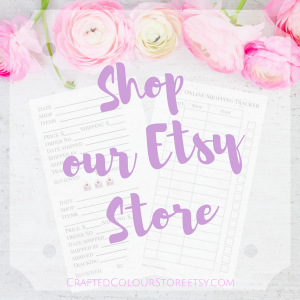 I LOVE how you personalized your bead! Excellent!